Our beautiful stainless steel drawer refrigerator/freezers (2), once the pride of our small ship’s galley – a source of great utility and convenience, have become erratic, finicky, ultimately unreliable. The summer heat dictates, and our tolerance now gone, they must be replaced! Fresh water (presumably from rain or a boat wash-down) is finding its way into the core decking of our boat-deck. The telltale drips (See associated blog) are colored with the tannin from the soggy wood. There’s a wound that must be cauterized and the cancer cut out. Mosey On is such a pretty boat, who knew? Then, while we’re considering what else may be imperfect….there are the inevitable nicks in the fiberglass. Some the Captain fairly owns…some entirely mysterious. And other things… but we shouldn’t (can’t afford to) be too picky! Though Mosey’s crew endeavors to be somewhat self-reliant in her maintenance, the skills to set these things right is beyond our abilities. 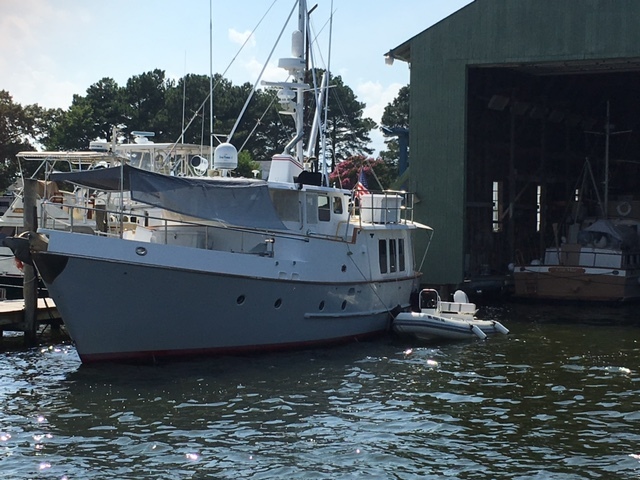 So Mosey On is in the boatyard to be fitted-out with new reefers, and to fix the Drips and nicks. It will be well worth the investment in a long and happy relationship! Aboard Mosey On, we attempt to maintain a status of wet outside, dry within. The source of fluid without is obvious, but Mosey carries stores of fluid within like fuel, potable water, oil, and effluent awaiting pump out. This fact tends to focus my mind on the lowly DRIP. Drips can be corrosive (depending on their content) like little lies are to trust. Small drips unattended can become torrents. (see above…). We tolerate small drips but are moved to act on ‘noisy’ ones. Drips are the ‘mothers’ of ice cycles. Can anyone accurately quantify a drip? Drips of life-saving serum are good. Drips of blood can indicate foul play. Drips from your car’s oil pan are annoying. Drips from a fuel line are dangerous. Drips of cooling water through a boats packing gland are necessary. Drips can make your nose raw. Stopping a drip often results in ‘busted knuckles’. Drips seldom get a date. This listing is, doubtless, incomplete. Please feel free to amend as you see fit. It’s the end of June and Mosey On and crew have had a languid, lazy month. Perhaps I should use the less pejorative ‘lacking in ambition’ rather than lazy…We have not, however, been totally idle. We welcomed our five-year-old granddaughter from D.C. aboard as additional crew for a week. You have experience with small characters of 5 years? Ya’ gotta love ‘em! 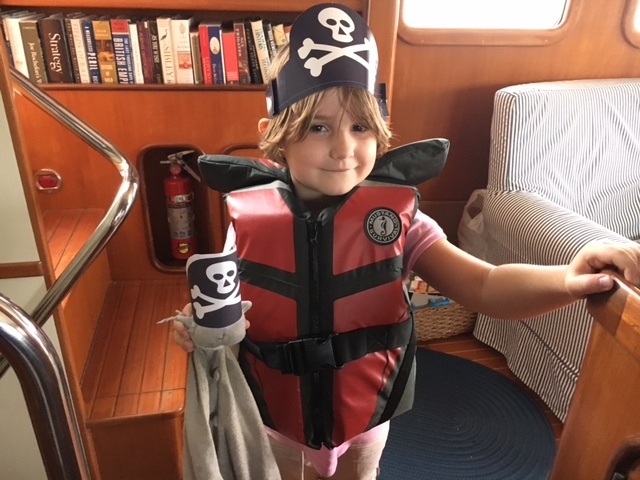 Now fully crewed-up, we pointed Mosey across the Chesapeake to Cape Charles, an appropriately small adventure in light of the new hand’s experience level. After some wind, some waves and plenty of sunshine we tied-up in the inner harbor across from a cement plant on a hot and dusty afternoon in a town that could have been the setting for “The Last Picture Show”. The crew abandoned ship in search of ice cream. After two days we had pretty much exhausted the adventure opportunities remaining in this once-bustling railroad and ferry terminus. Both are long gone and only a hopeful set of boutiques and pubs line the main street. Our new crew expressed a yearning for reunification with her mother in the not-too-distant future, so we cast-off to return to the western shore and an anchorage closer to her home ashore should that yearning persist. Mosey On dropped anchor in one of our favorite coves (from previous cruises) and lowered the dink to go exploring. High-diving pelicans, ghostly jelly-fish, high-speed runs in the dink and a French fries w/chicken nuggets lunch did much to restore the mate’s confidence! Card games, fishing, picking-up-after-ourselves pretty much filled our hours. The ‘greenhorn’ stayed her full cruise of five days and was cheerfully reunited with her mom. Mosey’s captain & mate relapsed into our well-deserved “lacking in ambition” mode! There’s a light rain falling this morning and our cove is tranquility itself. Moseyin’ On in a day or two….or not. 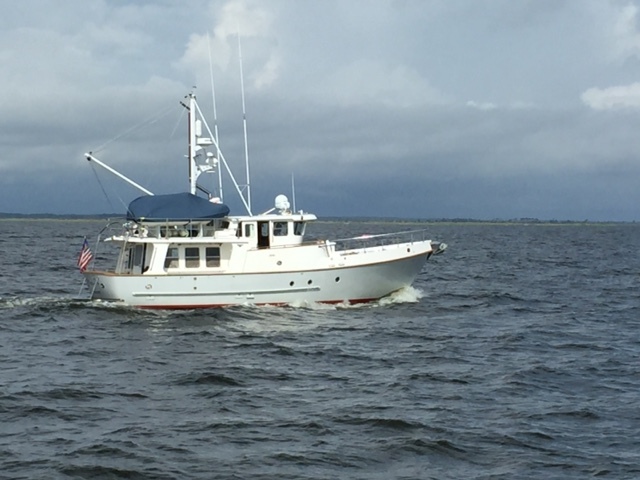 Mosey On and crew have begun our 2016 northbound cruise, leaving our home port at River Dunes, NC on June 1st in tandem with good friends aboard their trawler, the Mari Me. We would ‘buddy-boat’ the well-traveled route up the Neuse River to Pamlico Sound, the Pamlico River to the Pungo River, to join with the Alligator River north to Albemarle Sound. We crossed just ahead of the weather system offshore named Tropical Storm Bonnie. The shallow waters and stiff, wind-blown chop of the Sound littered with crab pots (traps) in our path all lived up to their reputation for a challenging crossing. Once across, we were back within the protected waters of the North River, Coinjock Bay, Currituck Sound, the North Landing River, and finally the man-made Chesapeake and Albemarle Canal into Norfolk. For those who have not seen the American Inter-Coastal Waterway (ICW), aka “The Ditch”, our four day passage from near Oriental, NC to Norfolk (approx. 175 statute miles) was typical of the waterway all the way down to its southern end in Biscayne Bay, FL. Always shallow, sometimes a ditch, more often a river or a series of markers to follow across tidal flats and marshes, navigating the ICW is a fact of life for cruisers along the mid-Atlantic coast. From our home port, we would otherwise have had to travel a day south to Beaufort, NC (toward the northbound Tropical Storm Bonnie) to reach a passage to the ocean. Only then could we have turned the boats northward and around Cape Hatteras to safe harbor in Norfolk. Aboard Mosey On this summer, “The Plan” [very broadly constructed] is to cruise Chesapeake Bay, its rivers and backwaters with an emphasis on the Bay’s Eastern Shore. We want to check out the old waterman towns like Cape Charles, Onancock, Crisfield, Oxford, Cambridge, and St. Michaels. 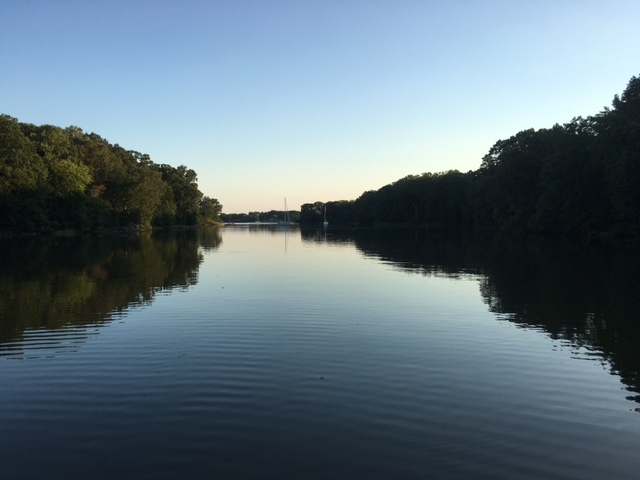 We’ll explore the Choptank River (site of Michener’s book “Chesapeake”), the Wye River (a favorite of ours), and the Chester River, meandering up (not surprisingly) to Chestertown, MD. To do all this, Mosey On and crew will be dealing with lots of shallow water. Last summer’s cruise to Maine was almost entirely in deep waters with wide tidal swings. In the rock strewn harbors and passages there, we were extra cautious to keep sufficient water beneath Mosey’s keel to avoid any granite surprises. But to explore the Chesapeake, we will have to use the high tides to get over the shallow spots en route to a deeper anchorage or marina. Once there, we may find Mosey On comfortably planted in the soft mud on the bottom. To leave, we will just have to await the next high. It’s a mental adjustment for me, but that’s how it’s been done for hundreds of years! Mosey On is tied-up in just such a shallow cove up the North River off Mobjack Bay. It’s a very hot weekend and we’re in no rush. A blue heron is stalking the shore for lunch and we’ve seen crabs swimming past the stern. In a few days we’ll slip over the shallows on a high tide and head north to Solomons Island and a visit with family. 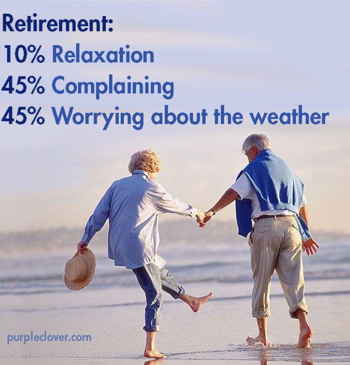 I think it’s a GOOD PLAN so far…. Too Hot to Mosey On….